The price shown is for the twin comforter set ensemble. Some of the optional Bolster, Square, Oblong and Euro stuffed accent pillows or drapes shown in the photograph are available at this time. Use the drop down menu to select the mattress pad you would like to add to your order. 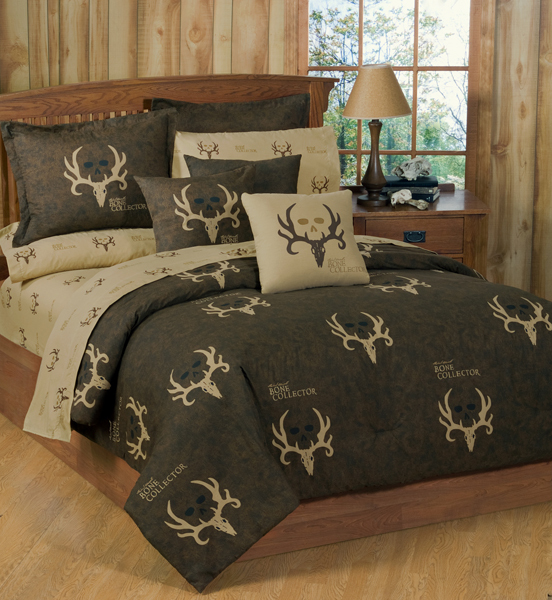 This exciting and innovative new Bone Collector bedding ensemble features the popular signature Bone Collector logo by Michael Waddell. The Bone Collector comforter and sham set includes a comforter and 2 standard shams (Twin includes one sham). The specially engineered shams and accent pillows feature the famous logo and signature skull design. The brown bone collector logo pillow reverses to brown faux leather; tan logo pillow reverses to Bone Collector sheets design. 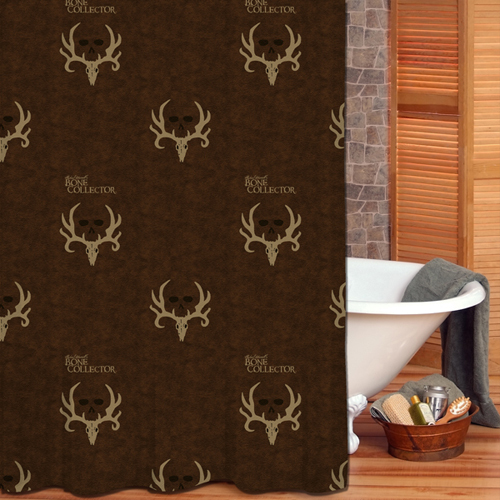 Sheets and pillow cases highlight the skull and Michael Waddell signature on a warm tan ground. Enjoy comforter sets in various styles and colors. Unique designs and classic solid colors are available. Browse our categories to find the comforter set that fits your needs. Proudly made in the USA! Our comforters are over sized and overstuffed, in the following sizes: Twin: 65" x 90", Full: 80" x 90", Queen 92" x 96" and King: 110" x 96". Made of washable Poly/Cotton. Our fabric is a comfortable but sturdy 180 Thread Count, 50/50 Polyester/cotton blend. The sheets fit most mattresses up to 13" deep. Comes as fitted sheet, flat sheet and two pillowcases (except twin which comes with one pillowcase). 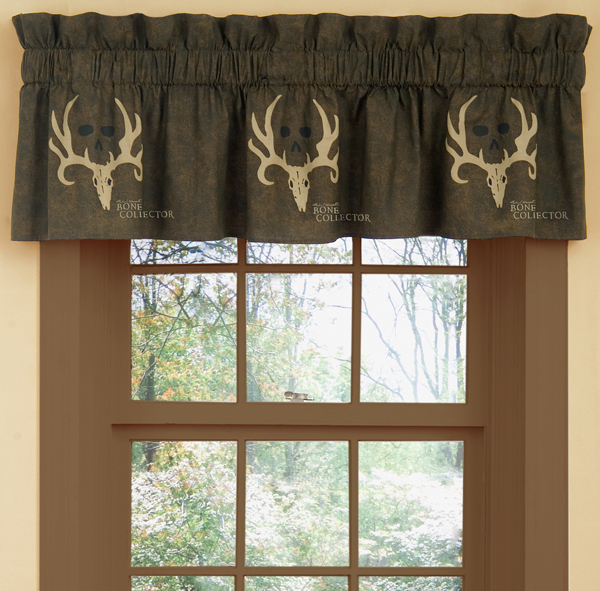 Drapes are Rod Pocket with 3" header, Two panels with Tie-backs (42" x 87"). Valance is 3" header (88" x 18"). The Square Pillows (18 x 18) are reversible print to solid. The bed skirt is coordinated, corner-cut, 14" drop. Bone Collector Lodge Style Comforter and Bedding Cotton Duck. 180 thread count.